Once thought extinct, around 40 Southern white rhinos were found in the northern KwaZulu-Natal (KZN, or Zululand) province of South Africa, in 1894. This discovery led to the creation of the now world-famous iMfolozi Game Reserve, which was once the Royal Hunting Grounds of King Shaka Zulu. By 1960, the rhino numbers had increased to 600, and "Operation Rhino" began introducing Southern white rhino into habitats across Africa and to wildlife parks in Britain, USA and Europe. This project became one of the most famous conservation success stories of the 20th century and resulted in the translocation of over 4,000 rhino to game reserves, safari parks, zoos and private game ranches all over the world. By 2013, the Southern white rhino population had peaked at 20,405. Strict protection of wild animals in KZN, in the first half of the 20th century, resulted in exponential growth of populations in game reserves. Many animals were given to landowners, and this was the beginning of game ranching in KZN. 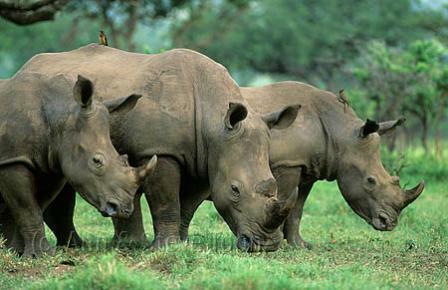 KZN’s rhino conservation efforts represent the greatest rhino conservation success story ever. Until 2007, any poaching was being kept under control, and any animals that were lost were naturally replaced with population growth. Then the killings and illegal trade became rampant. Country-wide, around 4,500 rhino have been poached since 2008, which is more than all of the rhino captured and translocated from the Ezemvelo KZN Wildlife protected areas since 1960. Now what does this mean, and why does it matter? Project Rhino was launched on September 22, 2011—World Rhino Day. The THANDA Foundation is one of the founding members of Project Rhino KZN and is actively involved in its conservation efforts. THANDA is dedicated to educating and informing communities, bordering the THANDA Private Game Reserve in order to protect the wildlife legacy and biodiversity of northern KwaZulu-Natal. 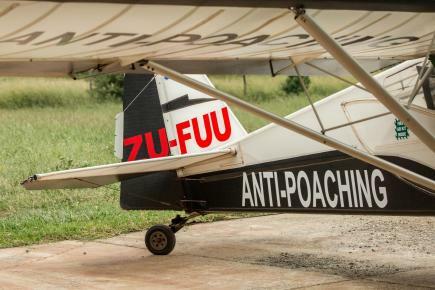 Project Rhino KZN is a collaboration between KwaZulu Natal's leading conservation agencies and provincial game reserves, provincial government bodies, private rhino owners and anti-poaching security specialists in fast-tracking urgently needed anti-poaching and conservation interventions. The Project is motivated by preserving the white and black rhino species thriving in KZN and beyond, "forever free, forever secure from poaching, well managed and protected". “Being in Hong Kong is quite symbolic”, said Pierre Delvaux, CEO of the Thanda Private Safari and Thanda Island (THANDA) at a Black Rhino Conservation lunch, held by Waldorf Investments partners at the exclusive Hong Kong Club. 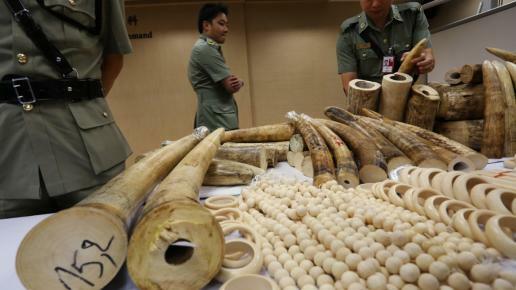 Following the HKD $72 million (US $9.2 million) bust in the ivory trade recently, THANDA places a lot of importance on Hong Kong being the gateway to China and Vietnam—major routes for the illegal trade and distribution of ivory. “Poaching is devastating a natural resource,” said Delvaux, appealing to the people of Hong Kong to start a dialogue to stop the trade that flows through the city. What is ivory, and why do people place such a value on it? "There will always be a market for items that have a perceived value attached to them. Take diamonds, for example", said Delvaux. "It’s something that comes from the ground that only have value because the diamond companies have convinced us that these stones have value, and we should therefore buy them. Preferably, a LOT of them." Now, like drugs, human trafficking, and diamonds, rhino horns and elephant, walrus, and sperm whale tusks are being trafficked and traded illegally. Technically, "old" trade is not legal in Hong Kong: there is a loophole that allows about 400 registered traders to continue to sell pre-1989 stock, which should have run out in 2004, claims National Geographic in its 2015 article “How World's Largest Legal Ivory Market Fuels Demand for Illegal Ivory”. Shops are replenishing their stock with illegally poached goods, sometimes passing goods off as mammoth tusks to avoid penalties. And how are the rhino paying for this loophole of greed and ignorance? With their lives and the possibility of extinction. And people are dying as well: this illegal industry means people are being killed while trying to protect the animals from poachers. Today, KwaZulu-Natal is proudly known as the home of the Southern white rhino, but it’s not enough. What was once a low-level law enforcement operation now borders on all-out guerrilla warfare, especially within the private reserves, which are being targeted. KZN has the second largest population of wild rhino (3,200) left in the world and is recognised as having the greatest genetic diversity of both white and black rhino. How will Project Rhino use the funds necessary to protect these animals? Guards are employed to protect herds, going as far as to sleep alongside the animals. In a space as vast as the Thanda Private Safari parkland (14,000 hectares), it’s almost impossible to get to the rhinos in time to save them if they are attacked by poachers. The animals can be microchipped and monitored at all times, and the local community needs to be educated about the value of rhino horn (zero) and the worth of lives. Money put towards this cause through Project Rhino goes directly to the cause. With funds, intelligence and information can be shared and guards can be hired to protect the rhino night and day. Without a massive initiative to completely devalue this product both for the traders and consumers, illegal trade will continue. The South African government is getting good results from its efforts to protect the rhinos, but small conservationist park like THANDA don’t have the luxury of military resources or personnel. 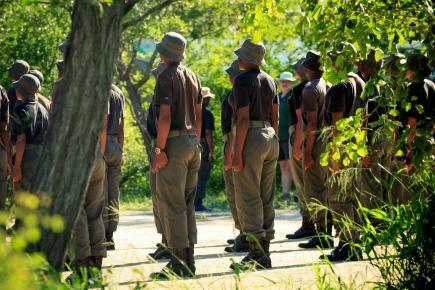 In a pilot project recently, Thanda Private Safari followed the decision of a few other parks to dehorn the rhinos. The theory was: why would a poacher kill a rhino if there’s nothing of value on it? How tragic was it then, to see a tiger maul a baby rhino, with the mother helpless to protect her young because she had lost her most powerful form of defence: her horn. 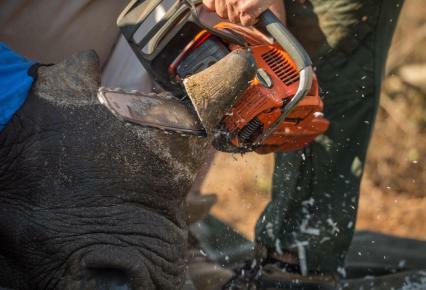 Delvaux found this incident particularly devastating because his team had been the ones to dehorn the mother rhino—this was not the work of poachers. Not only that, the park became a target for their efforts to discourage poachers from attacking the rhinos. Project Rhino KZN and THANDA are working to completely eradicate the illegal trade in ivory. You can help by fundraising, supporting the project and spreading the word about the senseless killing of rhino. For more information, visit THANDA's Project Rhino initiatives here. Meaning ‘love’ in isiZulu, THANDA is a proud member of The Leading Hotels of the World and multiple winner of World’s Leading Luxury Lodge. Thanda Island was voted the World's Leading Exclusive Private Island by the 2016 World Travel Awards and features on the Condé Nast Traveler 'Hot List 2017'. Thanda offers guests meaningful safari experiences and exclusive close-up encounters with Africa’s magnificent Big Five. To meet the low-carbon footprint requirements of today’s earth-conscious traveller, Thanda Island is powered by solar energy, while rainwater tanks maximise water storage and use of this precious natural resource. An on-site desalination plant provides water for the entire Island, whilst grey water is recycled for the rehabilitation of the Island's vegetation. 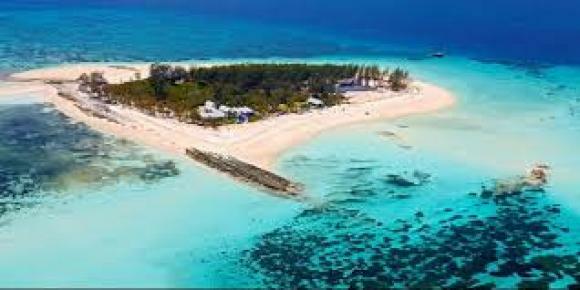 Thanda Island, leased by Thanda Tanzania Limited, is deeply committed to the conservation of the region’s sea turtles, dugongs, dolphins and whale sharks, as well as the preservation and rehabilitation of the Shungimbili coral reef. The Thanda Tanzania team is participating in a range of social upliftment programmes on Mafia Island, which has approximately 60,000 people. The closest community village on Mafia Island is Ras Mbisi, eight nautical miles from Thanda Island, and we are committed to the education of young people concerning sustainable resource utilisation and fish harvesting, as well as education in marine conservation and the development of healthy sporting activities, such as football.